...from a snitchy informant on the Tinseltown celebrity real estate scene–let's call her Ivana Blowarealestatewhistle–who rang Your Mama's bell this weekend to gossip about soon-to-be divorced sit-com queen Courtney Cox (Cougar Town, Friends) and her estranged actor husband David Arquette (Scream, Pushing Daisies, Never Been Kissed)who–according to Ivana–are about to put their Beverly Hills, CA crib on the market with a price tag somewhere around $20,000,000. They paid, as per property records, $5,450,000 for for the house in June 2004. We're not sure exactly how large or how many bedrooms the house currently has but the Los Angeles County Tax Man shows the Cox-Arquette crib measures 4,994 square feet and includes 3 bedrooms and 6 bathrooms. What we are sure of is that the sleek single-story house, supremely sited on a near one-acre mostly flat promontory in the lower Trousdale Estates neck of Bev Hills, was originally designed by A. Quincy Jones in the late 1950s and that the style-minded couple subsequently had the house worked over by Cory Buckner, a Los Angeles-based architect who, literally, wrote the book on A. Quincy Jones. Miz Cox is well known amongst celebrity property watchers for her intense interest and investment in notable SoCal architecture. In early 2007 the savvy aesthete coughed up a total of $17,150,000 for a two-parcel bluff-top compound in Malibu, CA. She spent the next couple of years and God only knows how much money to have the tightly knit collection of fairly ordinary mid-century ranch style structures transformed into somber-paletted, airy machines for modern living by L.A. architect Michael Kovac. The low-key but high-brow day-core was handled by Miz Cox's friend, the much in-demand decorator Trip Haenisch whose long list of celeb clients include Christina Aguilera, Hank Azaria, Cheryl Tiegs, Edward Norton and William H. Macy and Felicity Huffman. She had the house photographed for Elle Decor recently and, hunnies, it's out and out gorgeous. Your Mama doesn't know if Miz Cox and/or Mister Arquette own any additional properties outside of Los Angeles. We don't find any evidence they do but that does not mean a damn thing. What we do find evidence of, buried deep in the somewhat confusing property records, is that in December 2008 they paid an unknown amount of money for a property immediately adjacent to their house in Beverly Hills. We don't have any idea why Miz Cox and Mister Arquette bought the property or what plans they have for it now that they will soon be divorced. Wow, is it just me, or is that a totally ridiculous price for a very modestly sized house? I don't care how nicely redone it is or how great the views are, that price works out to over $4,000 a square foot...that's even more than is paid for the most expensive apartments in Manhattan! He's trying to reduce the $600.000 a month and there is bankruptcy somewhere in the picture. I do look forward to their being completely ruined financially by the divorce and both having to go to work trying to sell real estate or some such. New experiences are always to be welcomed for personal development. Ooo.. what a nice Sunday surprise this article is Mama. I was jonesing for both a juicy article and a snazzy property today and you delivered in spades, thank you! I can't wait for interior photos of this home to see what Courtney and David did to it. At the very least, I know it won't be boring. As for the McCourts, $400,000 A MONTH for her mortgage payments on 7 properties??? Why someone would 'manage' their life and finances like that is totally beyond me. Even for someone who can afford to, it's just too extreme.. nuts. Has to be bitter for Courtney, who is the brains here. She's put her family in an enviable position, only to have yet another overrated Arquette piss it away (Remember Roseanna?). You're a fool David. I would look fabulous doing an Esther Williams breaststroke across that lovely pool. @Aunt Gina- Gorgeous, I get the feeling you could look fabu' just stroking Esther Williams breasts across that pool! mama, i believe mark wahlberg's compound's interiors and close-ups are now listed at: http://www.trulia.com/property/3063102954-9694-Oak-Pass-Rd-Beverly-Hills-CA-90210. sorry to let you know this way (if you care) but i did not want to leave my e-mail address with you, nor do i have the ambition to create a new one. This is one of the best homes in Trousdale. It's fabulous inside and out (really it is !) but Hedge fund managers from OC don't come along every day paying over market value in these strange times. It might have happened to JA but what are the chances of lightening striking twice ? It's a great property but is it worth over 20m to a knowledgeable buyer in this market? 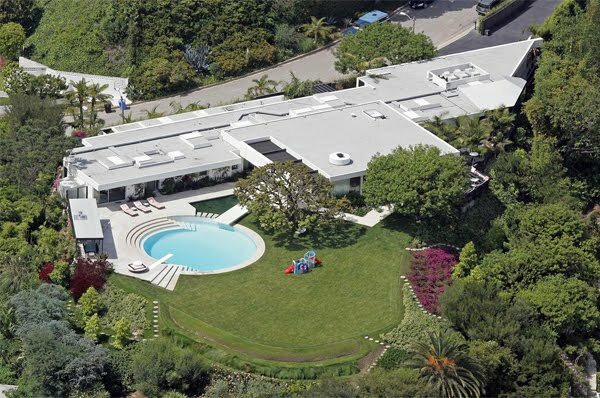 It just amazes me how much real estate to the stars is so over-inflated in price and value. It's ridiculous. How much do you need to spend on a property to prove that you're a star and should be living like one. $20M is just off the planet and totall unnecessary in these hard times. Half the house, half the price. THAT POOL THAT VIEW!!!! Morning Bloody Mary! P.S. for 20 Million I believe this is the house that has a carport for 3 cars... no Garage.... while very "Mid Century" not what you would expect for 20 million! Then she should do like Aniston did & have the thing photographed by A.D. just before she puts it on the market. Then we could really see what's what. Lovely pool. I wonder what she has her eye on? It is her hobby, perhaps now that Malibu is finished she can move onto another project in town. For $15 million I can buy a nice hotel on the beach in the Caribbean. These people in L.A. and in N.Y. are on crack. It is indeed a fabulous house. @anon 9/12 1:41 - Aniston's house sold for 17% less than asking. Your prediction of 16-18m is right in that ballpark. @Fleur - 99.9% of the houses Mama writes about are "unnecessary". That is why this is a celebrity real estate blog and not a political commentary blog. @ anon 9/12 7:31am - Cover the cars and employ a houseboy to keep them sparkling clean. Why clutter the architecture with a garage? @ angie - look up the details on McCourt's 7 properties and you will see why it take 400k to cover the mortgages. I predict there will be a sell off when the divorce is final. "For $15 million I can buy a nice hotel on the beach in the Caribbean. These people in L.A. and in N.Y. are on crack." If your work is in NY/LA then living in the Caribbean isn't really an easy commute on a daily basis. Besides, people live in cities for a reason ... the Caribbean may be nice for a week but year round it would be boring as hell. Anonymous: Don't be stupid... in the Caribbean there are cities as well!